What will you be doing this Mother’s Day? Delivering or receiving breakfast in bed maybe? A nice meal out? As much as I like going out to eat, I always feel a bit weird about eating out on special occasions like Mother’s Day or Valentine’s Day. I feel somehow gullible? Like everyone else is just there because they think they should, and I’m buying into an international money making plot. What I DO love though is when someone else makes me dinner at home. Belle is actually pretty good at this, and does cook two or three times a week, but even then I have to decide what we’re going to have and do the shopping, which is the most tedious part of the whole thing. Note: number two is not meant to be a present – probably go with flowers or chocolates as an actual gift – it’s just to help you with point one. I can hear you muttering here – ‘Jeez, is there anything this woman won’t write about?’ – but bear with, because Bacofoil® was actually a bit of a revelation for me. If you’re as much of a massive lazy bones as me and you’re not already using it, it’s going to be something you actually want to read about. I don’t know why, but I never think to use foil when I’m cooking. I’ll use it to wrap up a bit of cheese for the fridge or something, and I use greaseproof paper for baking things like cookies, but it’s never occurred to me before to line roasting trays or anything like that with foil. Perhaps because I’ve never had Bacofoil® The Non-Stick Kitchen Foil before! Bacofoil® The Non-Stick Kitchen Foil has a unique BacoLift® Surface which prevents food from sticking. This is genius if, like me, your oven dishes are glass or ceramic and prone to becoming encrusted with bits of roast potato and chicken skin. Rather than slaving away for ages after dinner at the sink, trying to chisel off baked on food, you can literally just take out the foil, chuck it in recycling* and put the dish straight back in the cupboard! Honestly, why have I not been doing this my entire life?? Let me talk you through a Mother’s Day lunch idea and show you how it works. I’d say that as a family, chicken is our favourite kind of meat. We’re more breast people though, (ooer), so cooking a whole roast chicken can end with a lot of waste and/or obese cats. 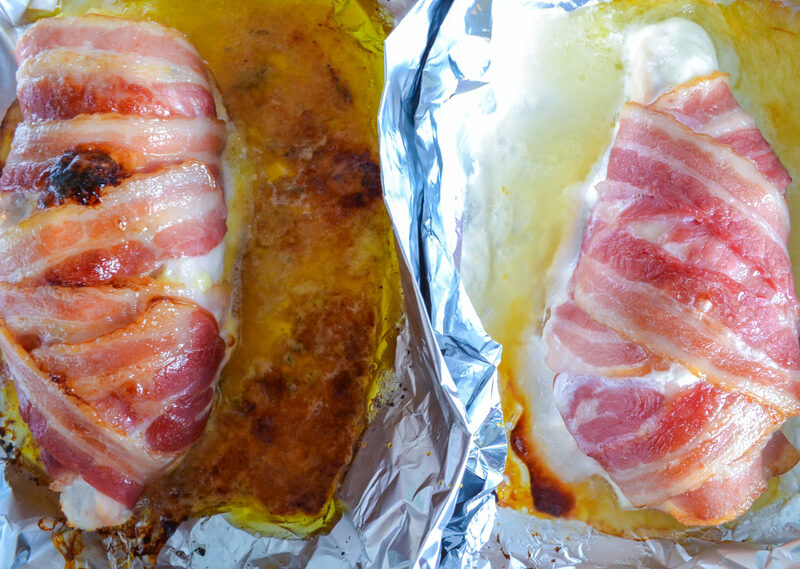 Instead I like cooking individual chicken breasts, stuffed with tasty things, and wrapped in bacon. 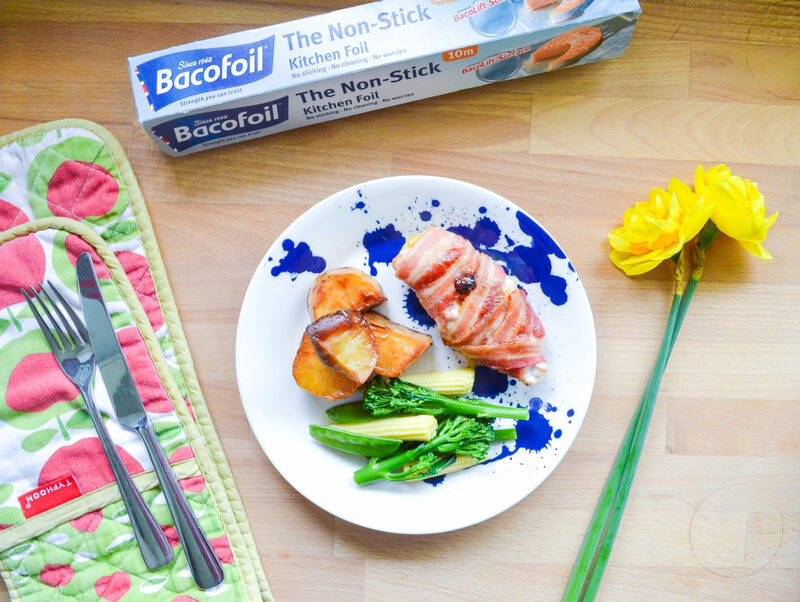 Immediately I discovered another benefit of using Bacofoil® The Non-Stick Kitchen Foil, for fussy families. Chicken fillings: I love blue cheese, but Belle would rather chop of her own foot than go near a piece of stilton. She’s more of a mozzarella kind of girl. Normally I’d use two separate dishes and then have to wash baked cheese off them both, but this time I made Bacofoil® SECTIONS! 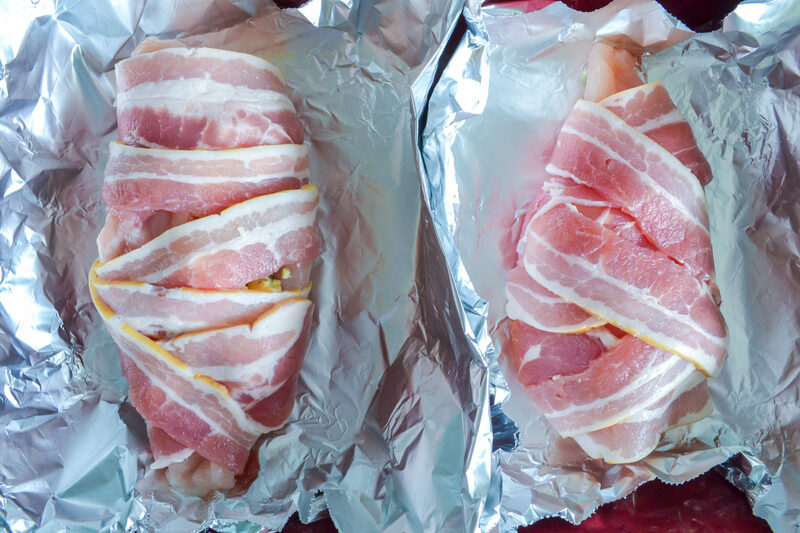 Each piece of chicken had its own little nest, made out of Bacofoil® The Non-Stick Kitchen Foil, to keep the flavours separate within the same dish. Note that Bacofoil® The Non-Stick Kitchen Foil has to go NON-shiny side facing up – that’s the non-stick side. 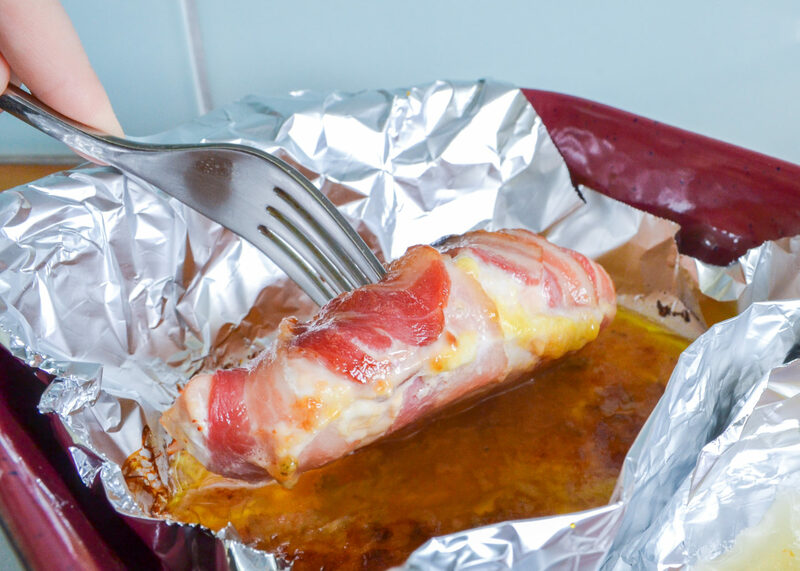 Another benefit of using Bacofoil® The Non-Stick Kitchen Foil is that you don’t need to add any oil to grease the trays, so you’re reducing the fat content too. Ignore the fact that my chicken is oozing cheese – that’s by the by. 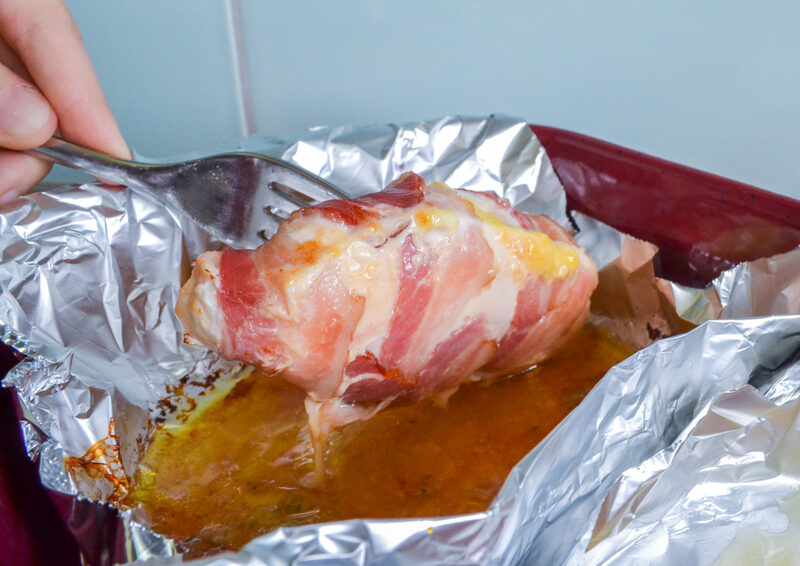 About ten minutes before the end of cooking I drizzled each breast with honey, then did the same to the chicken, (har har), just to give Bacofoil® The Non-Stick Kitchen Foil an extra sticky challenge. It would normally be this point in proceedings where I’d look at my dinner and sigh a bit, imagining having to do the washing up an hour or so later once everything had gone nice and crusty. I’d look around for a hefty utensil, ready to try and prise my food away from the base of the dish. You see how easy it lifts away? Have you ever seen a smoother bottom? The roast potatoes worked just as well – nothing welded to the pan, nothing needing to soak while we ate. All I did was drain off the excess liquid, carefully fold up the foil, and put it in the recycling. The dishes were perfectly clean, just like I’d never used them. You see what I mean about it being a revelation?? 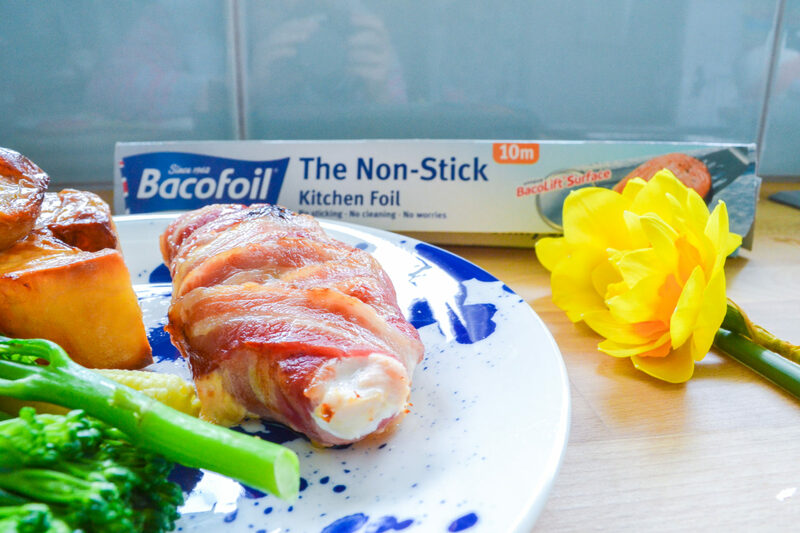 I’m sure there are some of you who’ve been using Bacofoil® The Non-Stick Kitchen Foil for ages and are chuckling gently to yourself at my naivety, but if you haven’t and this is all news to you then all I can say is YOU’RE WELCOME. *All of Bacofoil®’s aluminium products are 100% recyclable. Next Post How switching to vape could be beneficial to the whole family?